StoneTree® Fence color options are limitless, giving your fence a customized feel which complements existing surroundings and landscape. Each of our fences is unique and we ensure it matches your property perfectly. Our specially formulated concrete sealer, which penetrates into the concrete and protects the beauty and longevity of the fence wall, may also be combined with your choice of a wide variety of color pigments to obtain that specialized appearance desired. Many types of accenting techniques may be used to obtain the appearance of a more realistic or artistic look of the fence wall using one or more complementing colors. It does not matter where you are located, our fences can be personalized to match their surroundings and compliment other natural elements. We have built fences all over the world, and have experience creating fences that look great in every environment. Additionally, our stains seal the concrete wall adding an extra level of protection and ensuring that the concrete does not succumb to water, ice or any other damage. Our Fence Stain Colors Add to the Perfect Fence! 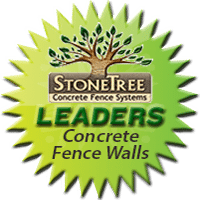 StoneTree® fences are already the perfect addition for your property because they are customizable, designed on both sides of the fence and utilize the most advanced installation process in the industry. Combined with our limitless color options, our fences can be manufactured for any environment. We offer a free quote so you can talk to us about our fencing options and tell us what you want your fence to look like. Come get the best low-maintenance designer fence available for your property. Call today, or fill out our form to the left, to learn more about our concrete fences and fence stain colors!